Salem, OR—Governor Kate Brown proclaimed January 26, 2019 as the first Cascadia Preparedness Day in Oregon. 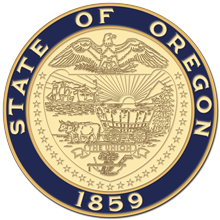 Governor included robust goals in her resiliency policy agenda to help Oregon survive and recover from the expected 9.0 magnitude Cascadia earthquake and ensuing tsunami. "When the next Cascadia subduction zone earthquake strikes the Pacific Northwest, Oregon will face the greatest challenge of our lifetimes," said Governor Brown. "Oregon's buildings, transportation network, utilities, and population are underprepared for such an event, and we must accelerate our preparations. It is critical to fund an early warning system, and to work with local governments, community groups, and the American Red Cross to ensure that 250,000 vulnerable homes have two weeks of ready supplies in the next three years." Governor Brown's focus has been to continue state investments in seismic upgrades of schools and emergency services buildings throughout Oregon, develop a plan for the critical energy infrastructure hub to prevent and mitigate catastrophic failure, implement a statewide earthquake early warning system by 2023, and work with partners and community groups to make sure more families have supplies at the ready. Governor Brown's priorities include strengthening local emergency management organizations, developing more robust logistical staging bases, local supply chains, and more earthquake and mass displacement insurance options. In the Governor's budget, she included $100 million for seismic rehabilitation grants, $20 million for emergency service buildings throughout the state, and a dam safety task force. The proclamation is available here . Read Governor Brown's resiliency policy agenda here .